Happy Tuesday! 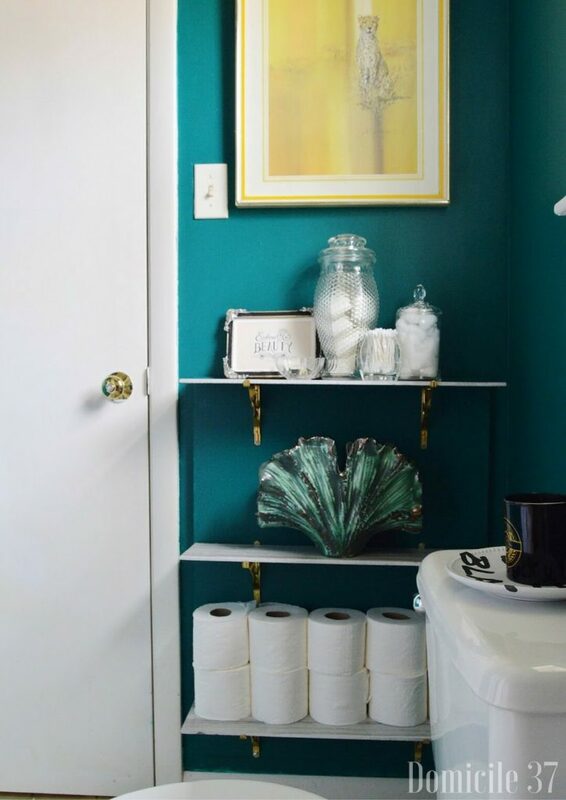 Remember when I painted my master bathroom that beautiful jewel tone color? 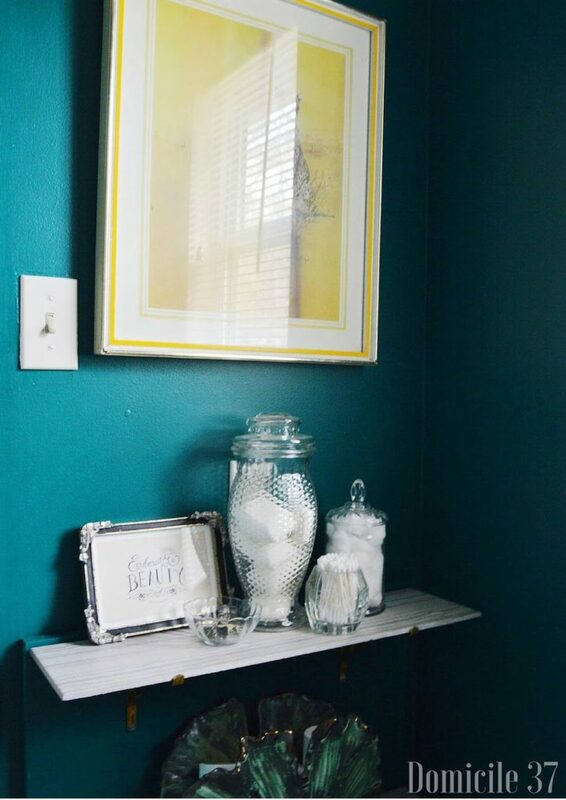 Well, today I am sharing how I create a rental friendly DIY Shelving in that bathroom. 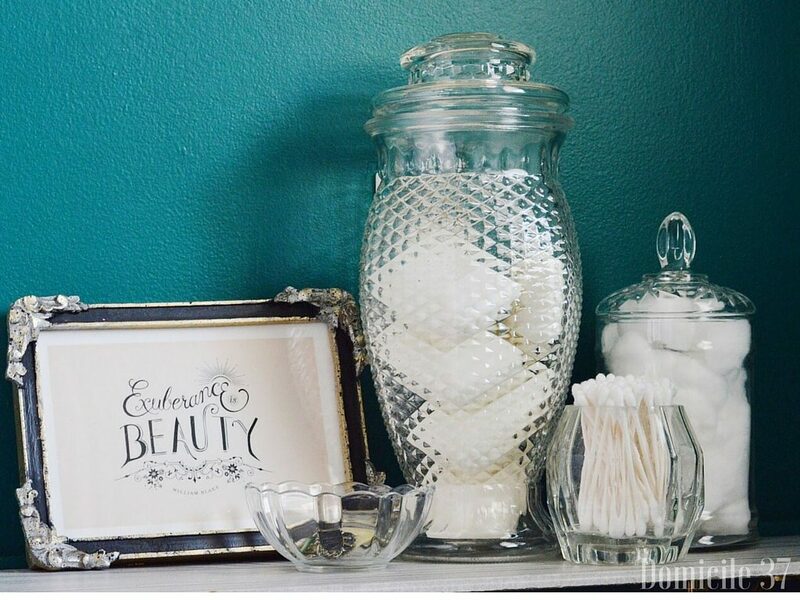 One of my biggest pet peeves is a messy bathroom and I really wanted to create a solution to where we can maintain the cleanliness of the bathroom and incorporate some type of bathroom storage. 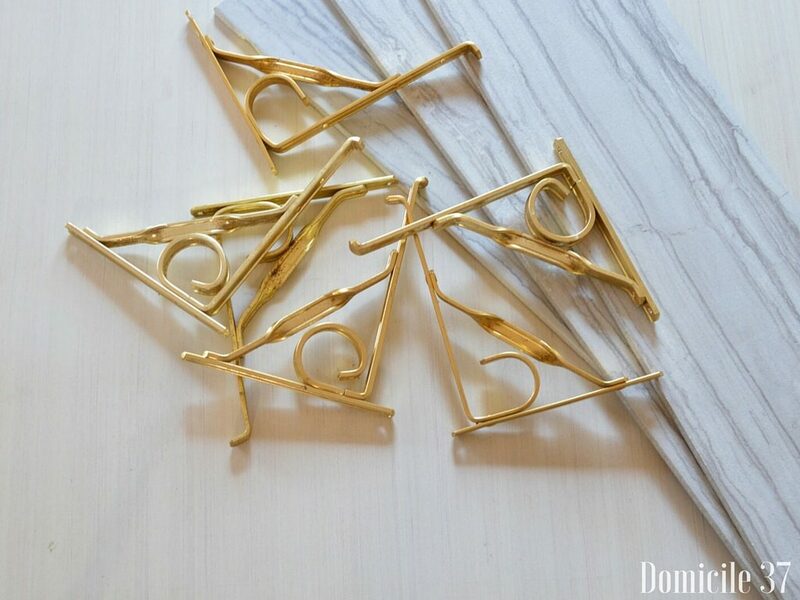 A few years ago, I found 6 gold metal shelving brackets that were approximately 6″ deep for $2.99 (yes, all 6 were $2.99) and I have since been hoarding them, because I knew one day I would use them. Now is that time. 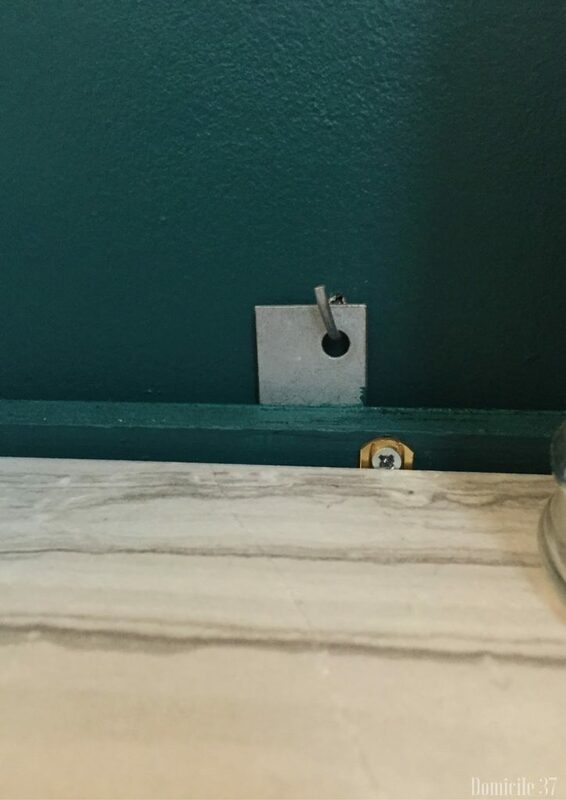 As a renter, I do not like to make unnecessary holes in the wall and I really did not want to make 12 holes in my bathroom wall (2 holes per bracket). So I hacked something together and made it happen. 3. Attach flat bracket to back, leaving the last hole exposed at the top. 5. Insert monkey hooks on wall in desired location and hang wood with shelves attached. Note: I used tile because in this particular situation it was light weight and cut already in the desired size I needed. My monkey hooks can hold a combined weight of 100 lb. but I would like to keep this shelving unit as light as possible, so I do not store heavy duty objects on it. I also try to spread out the weight evenly. I painted the wood the same exact color as the wall to give the illusion that brackets are installed on the wall. In the picture above you can see how the wood looks against wall close up. Right behind the photo and my apothecary jars is where my monkey hook and flat brackets meet. LOVE those brackets! what a steal and they look fab! thanks. I was shocked that they were so cheap…but then again, it was thrift store. This bathroom keeps getting better and better! 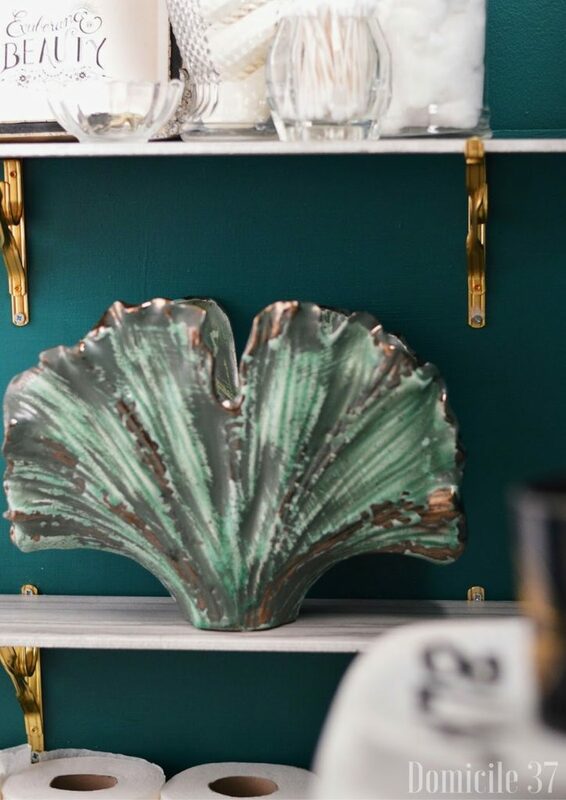 Great shelves and that wall color… can't get enough! Thanks girl. I love the contrast of the shelves against the wall…it makes me giddy. What a great idea! I'm always torn between making holes in the walls (knowing I'll have to spackle & paint later), or just living without. This is a great solution. thanks….no matter what I will have to repaint this space white, but after moving from the other house and spackling every hole…i did not want to have to deal with all of that so I am trying to be conscience of where I hang things.